1 year 2 months ago. 1 year 10 months ago. antisocialmus That was fun, join us back at lovely @ShapeShifterLab 6/8 for choral show w @eddiethepancake's "Chewy Foot" and @franznicolay's "PEOPSSONGS"
Anti-Social Music is at Flatbush Jewish Center. Wednesday in Kensington BK! Sandcatchers is: Yoshie Fruchter (oud) Myk Freedman (lap steel) Michael Bates (bass) Shai Wetzer (percussion) with guests Jean Rohe (vocal) and Tim Sparks (acoustic guitar) 2 days 5 hours ago. Save the date: Tue 14 May 7:30 PM at the Areté Venue and Gallery! Solo works performed by Gordon Beeferman, Sarah Bernstein, Ty Citerman, James Ilgenfritz, Pat Muchmore, and Barry Seroff art: Emily Hope Price 1 week 6 hours ago. If a wild beast lurks In our humanity, Let me turn it toward A mild humility 3 months 3 weeks ago. Anti-Social Music is with Kamala Sankaram. What are you doing next Friday night? cc: New Camerata Opera 4 months 4 weeks ago. New York City’s punk-chamber music collective, featuring members of The Hold Steady, Balkan Beatbox, Asphalt Orchestra, World/Inferno Friendship Society, Beauty Pill, Gutbucket, Mohair Time Warp and more, present their third full-length release which features the group’s most prolific composer. Anti-Social Music: ASM has spent over 10 years of performing in punk squats, basements, rock clubs, and concert halls - and the music hasn’t fit in anywhere. ASM came together in November 2000 for what was originally intended only as a one-off concert called “An Afternoon of Anti-Social Chamber Music.” Now, ASM presents concerts twice yearly of exclusively premiere compositions written and performed by ASM members and associates ... which, are, by the way, intended to not be so gosh-darn serious. This stuff is supposed to be fun, no? The group fills the year with monthly repertoire shows featuring themes and greatest hits, often pairing with punk groups, weirdo jazz groups, and theatre acts. And most shows feature artwork and stage design by some of their favorite local artists. Pat Muchmore: Somewhere between a theory professor at Sarah Lawrence College, a cellist/trombonist/pianist on loads of rock records, and a PhD whose dissertation analyzed Nine Inch Nails, you’ll find Pat Muchmore - whose intense music is at once viscerally immediate and compositionally rigorous. 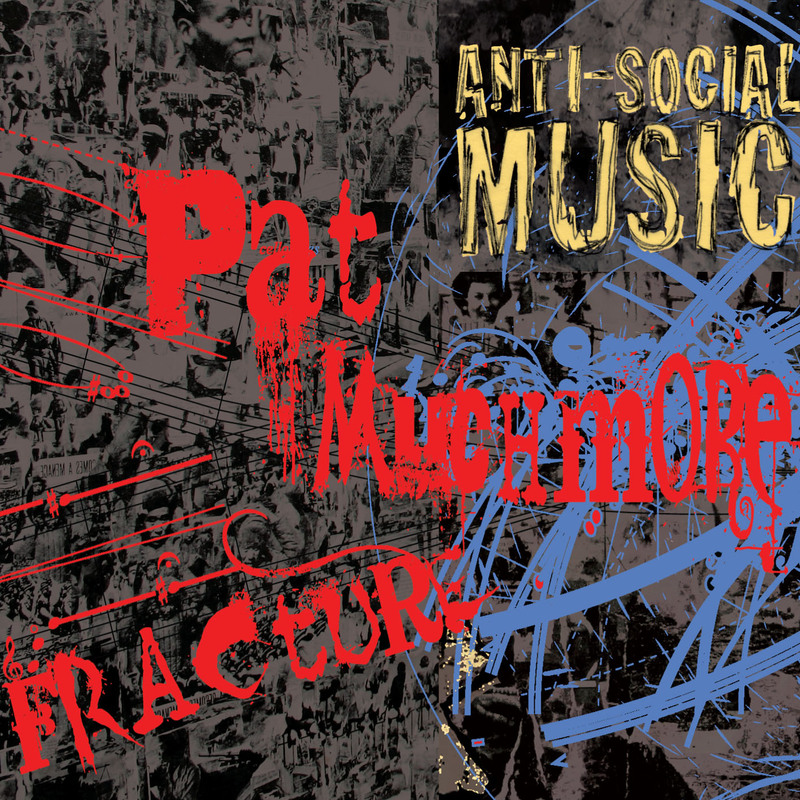 After Muchmore’s “Fracture II” was the lead track on Anti-Social Music Sings the Great American Songbook (Peacock Records), Muchmore’s fractured ethos and legendary performances began to encapsulate the entire spirit of ASM. Thus the full-length Fracture. ...Certainly, the compositions in Fracture are fun to play. Listening to them is another matter, or at least an acquired taste. Songs like “shitfuckcumbastard” are as abrasive as you’d expect, and sweetly titled tracks like “gumdrops and kittens” provide no respite. The chaos lies somewhere between John Zorn’s Naked City skronk and a nightmarish noir score, a little bit organ-grinder meets meat grinder. But there’s more to this than wild, antagonizing dissonance. ...Muchmore doesn’t subscribe to time or key signatures, but he has a fine ear for detail and finds unique ways to transition between fragments, fusing acoustic instruments with samples and electronic tones. This disorienting melee may not be new territory (consider Mr. Bungle), and it offers a limited palate of emotion (mostly fury). But Anti-Social provokes more than it infuriates. "... the performers ... turn out the most violent but dead on multiphonics, ultra-altissimo, overtones, measured feedback, violent but controlled bowings and – occasionally – beautiful jazz flavored melodies." Il collettivo da camera di New York, che comprende tra gli altri membri di The Hold Steady, Balkan Beatbox, Asphalt Orchestra, World/Inferno Friendship Society, Beauty Pill, Gutbucket, Mohair Time Warp, dichiaratamente punk nel nome, nella filosofia e negli intenti, si unisce per registare in questo album la musica del compositore multistrumentista (violoncello, trombone, pianoforte) Pat Muchmore. Non nuovi alla frequentazione con il compositore - ne avevano registrato il brano Fracture II nel loro album ‘…Sings the great American Songsbook’ - si ributtano in questo magma sonoro ridando vita alla scrittura di Muchmore. Con brani dai titoli che sembrano essere la bella copia di quelli di Anthony Braxton, praticamente illeggibili, la musica, dissonante, urticante, suonata in maniera superba, ad un primo ascolto colpisce fisicamente l’ascoltatore buttandolo a terra svenuto. Dopo essersi ripreso e aver inavvertitamente premuto di nuovo play sul lettore, un altro colpo vibrato a tutto pentagramma dona la visione alle sue povere orecchie frastornate e deturpate. Una visione che incredibilmente piace, che non annoia, anzi! Sembra impossibile ma è chiaro che il collettivo sa suonare, sa osare e disturbare, ma senza eccedere e strafare al punto da invogliare chi ascolta a gettare il cd dalla finestra. Anzi dal magma cacofonico escono delle strutture composite e autosufficienti, che si esplicano in brani strumentali ascoltabili ripetutamente per la gioia e il turbamento uditivo di chi si cimenta nell’impresa. Gli strumenti dialogano, si accapigliano, creano movimenti che si ritorcono su se stessi, svincolano, ma come per magia alla fine fanno riportare regolarmente i conti, concludendo i brani con eleganza senza sbavature e vicoli ciechi. In conclusione l’album piace, intriga e si rende una piacevole scoperta nel panorama musicale contemporaneo. Herding ASM into "third-stream" is a little uncalled for. They more are outer-edge, modern classical. "Gumdrops and Kittens" serves up what could be called a "gnarly" opening riff on guitar/violin. The jarring swell sloughs off into a tense climax and enters into the album's first real movement, "Fracture IV." Here, the group is in a purely cinematic form, dipping in and out of sections featuring fluttering winds, clunky piano, and low, moaning brass sections. These larger tracks, running over 10 minutes, including "String Quartet No. 2" and "PortRait_7," have the group maintaining improvised discipline and working the songs up to more frantic parts or vice versa. "shitfuckcumbastard" is an uncomfortable, daunting yet beautifully layered track. A tapestry of trembling strings and accordion fall in place behind short, staccato tenor sax hits which slowly go from spiritual Coltrane-like to frantic, hoarse Shepp-like. Although the album is drum-less, the groups series of "Broken Aphorisms" (eight of which appear here) have low, orchestral anchoring in cello, violin, and trombone with piercing highs of dual flautists. With the help of accordion and piano/keyboards, all of these work towards a sinking ship of middle range for a very interesting sounding conference. "More than any school day field trip or Sunday matinee, it's through this adventurous type of orchestral instruments that classical music's hopes in staying alive and relevant rest." Fracture is the musical equivalent of a box of chocolates, with none of the chocolates being the real sweet, milky pieces. No sir, this is the dark, hard stuff, and if you prefer your candy undiluted and strong that way, Anti-Social Music has a Whitman's Sampler for you.